After gorging ourselves on french onion soup mac & cheese for a week, it’s time to atone for our sins. Or at least get some new vegetables circulating in the system. I’m practicing my future mom skills with this “recipe:” what’s in the fridge tonight, will it be done in less than 20 minutes, how can I make it look like pasta, and will it be at least as good the second and third and fourth times? Combine lentils, water, garlic cloves, bay leaves, and a dash salt in a medium saucepan. Bring to a boil, reduce to a simmer, and let it cook for about 15 minutes, or until the lentils are cooked through. While the lentils cook, chop the rest of your veggies. When the lentils are done, remove the bay leaves – and if you have a garlic press, which I really, really hope you do – pass the cooked/softened garlic through the press and mix it all around. Combine lentils with tomatoes, scallions, basil, feta olive oil, lemon and give a good toss. Serve on top of salad greens for a little more oomph, top with freshly cracked pepper. 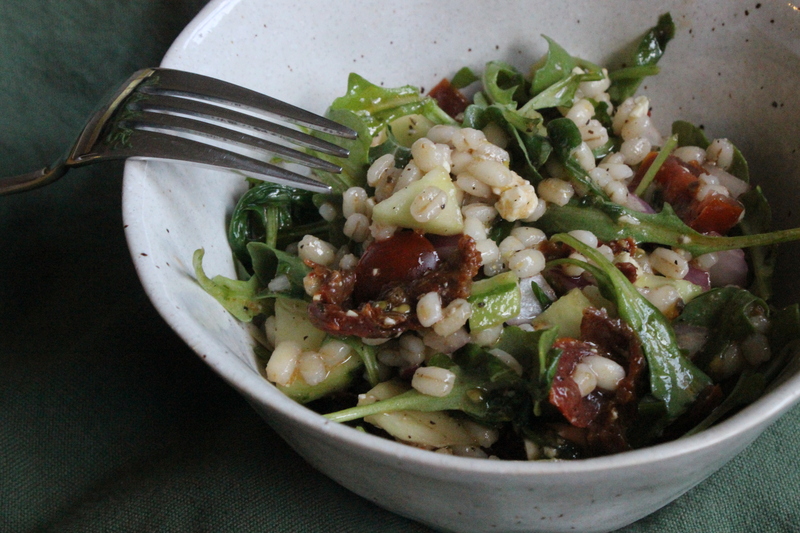 The big bonus from this lentil salad is: it actually looks and tastes like risotto. So basically, we’re eating straight pasta for the second week in a row! Hollerrrrr. We are home. And we are stuffed. For the past week, we have eaten nothing but baguettes, cheese, croque madame, pain au chocolat, croissants, steaks and frites. We have consumed bottle after bottle of champagne and red wine. We bought ice cream cones for the express purpose of passing the time, standing in line for museums. We were gluttons and we are not sorry. Paris and London were in a word, amazing. We climbed all the monuments (sort of atones for the food? maybe?). We took boat tours down the Thames and the Seine, and toasted each other as the Eiffel Tower lit up the sky. We looked at crowns and wandered through gardens. We saw close friends and family; I wandered the grand flower store at the foot of our old apartment, where my father took me the day I turned 8 and let me pick out any flowers I wanted for a birthday bouquet. We are stuffed – food-wise, but also joy-wise. (I know, I’m cheesy, but it’s just the truth.) In that honor, some stuffed chicken breasts I made before we left. After you rinse and pat dry chicken breasts, rub with a little bit of olive oil and generously season with salt and pepper. Use a small knife to carefully make an incision in each chicken breast; take care not to cut it all the way in half (you want to create a little pocket for all your goodies). Place each chicken breast under a sheet of parchment and pound with a mallet or small pan.so they are each less than an inch thick. 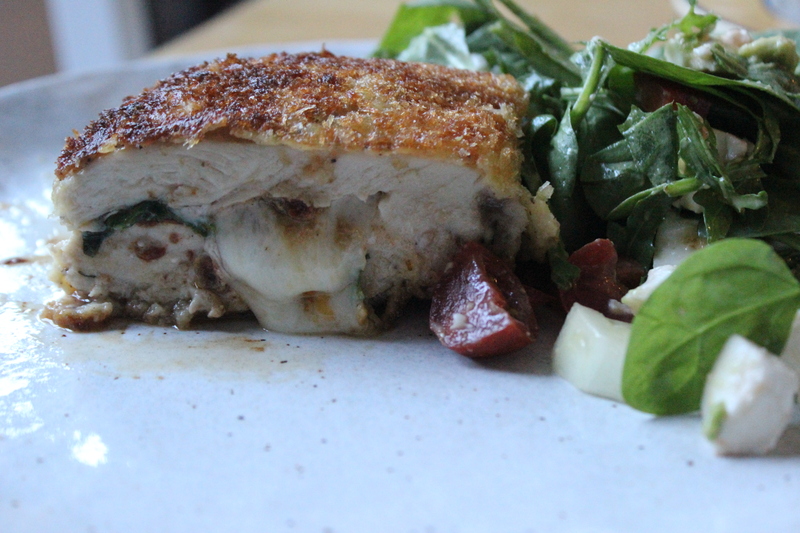 Insert a layer of basil, mozzarella and a few sundried tomatoes into each “pocket” of the chicken breast. Dredge each chicken breast individually in the flour, shake off excess flour, coat in the beaten eggs, and then dredge in panko. Repeat for each chicken breast. In a large saute pan, heat olive oil over medium heat. Without crowding the pan, cook each chicken breast for about 3-4 minutes on one side. Lower the heat and use tongs to carefully flip to the other side, cooking an additional 3-4 minutes. Keep chicken warm while you cook the additional breasts. Serve with a side salad and some crusty bread. This is a go-to in our house: that panko crust keeps the chicken juicy and crispy at the same time, while the cheese just oozes on to your plate. And no one argues with oozing cheese. Fun fact about me: in college, when most of my female classmates were dressing as “under-dressed fill-in-the-blank (nouns)” for Halloween, I went as a teenaged boy. A teenaged Newsie, to be precise. Because there’s nothing like a light-hearted song and dance number about ending child labor, right? On Friday, it took all of 30 minutes to conceive of and execute on this salad (inspired by Cooking Light). Meaning I had plenty of time to drink some vino and get to Newsies the Musical (!!) on time, along with my former roommate, also a former Newsie for Halloween. Word to all my Boston friends: it’s coming (as in the production, not this salad) to your city next. Bring two cups of salted water to a boil, add barley, reduce heat and cover. Simmer for about 10-15 minutes, or until all of the water has been absorbed. Meanwhile, combine lemon rind through salt and pepper in a large bowl and whisk to create a nice dressing. Add red onion through cucumber to the dressing bowl and toss gently. When the barley finishes, mix that in and add sundried tomatoes with oil, as well as Feta cheese (the heat from the barley combined with the oil and the Feta cheese will create a nice creamy texture). This is lovely served both immediately and chilled. Since the blueberry mint salad extravaganza, I’ve been decimating the Trader Joe’s shelves of quick-cooking farro and barley. It’s just so good, and so easy, and so…tasty, while being healthy. Perfect for seizing the day.